Perforated Adhesive Vinyl Printed in Full Color on 6mil Vinyl with option for a 2mil Clear Laminate. Printed on 6mil White Perforated Adhesive Vinyl. Recommended for use on flat vehicle windows or retail store windows. Perforated Adhesive Vinyl: If you want to wow with your window graphics, consider our Perforated Adhesive Vinyl. Not only is it printed in full, vivid color on a 6mil White Perforated Adhesive Vinyl, but you also have the option to add a 2mil Clear Laminate for enhanced durability. 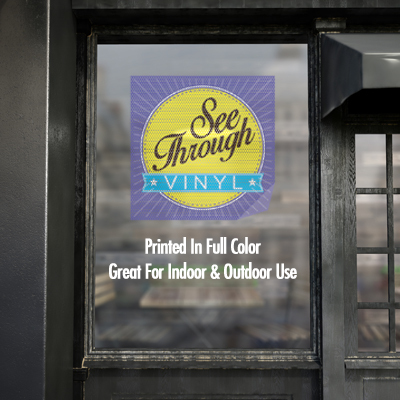 We recommend using our Perforated Adhesive Vinyl on flat surfaces such as store windows, vehicle windows, and mirrors. Available in a variety of sizes and in quantities of 1, 3, 5, 10, and 25.